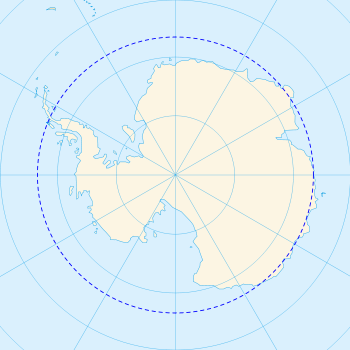 The position of the Antarctic Circle is not fixed; as of 26 April 2019, it runs 66°33′47.6″ south of the Equator. Its latitude depends on the Earth's axial tilt, which fluctuates within a margin of more than 2° over a 41,000-year period, due to tidal forces resulting from the orbit of the Moon. Consequently, the Antarctic Circle is currently drifting southwards at a speed of about 15 m (49 ft) per year. In astronomy, declination is one of the two angles that locate a point on the celestial sphere in the equatorial coordinate system, the other being hour angle. Declination's angle is measured north or south of the celestial equator, along the hour circle passing through the point in question. A circumpolar star is a star, as viewed from a given latitude on Earth, that never sets below the horizon due to its apparent proximity to one of the celestial poles. Circumpolar stars are therefore visible from said location toward the nearest pole for the entire night on every night of the year. The polar night occurs in the northernmost and southernmost regions of the Earth when the night lasts for more than 24 hours. This occurs only inside the polar circles. The opposite phenomenon, the polar day, or midnight sun, occurs when the Sun stays above the horizon for more than 24 hours. "Night" is understood as the center of the Sun being below a free horizon. Since the atmosphere bends the rays of the Sun, the polar day is longer than the polar night, and the area that is affected by polar night is somewhat smaller than the area of midnight sun. The polar circle is located at a latitude between these two areas, at the latitude of approximately 66.5 degrees. In the northernmost city of Sweden, Kiruna, at 67°51'N, the polar night lasts for around 28 twenty-four-hour periods, while the midnight sun lasts around 50 twenty-four-hour periods. While it is day in the Arctic Circle, it is night in the Antarctic Circle, and vice versa. The North frigid zone, between the Arctic Circle 66.5° N and the North Pole 90° N. Covers 4.12% of Earth's surface. The North temperate zone, between the Tropic of Cancer 23.5° N and the Arctic Circle 66.5° N. Covers 25.99% of Earth's surface. 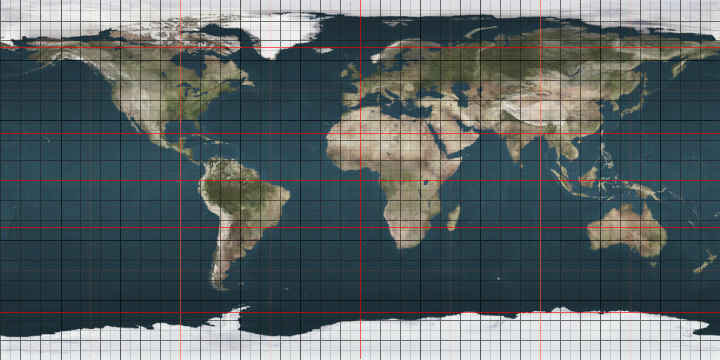 The Torrid zone, between the Tropic of Cancer 23.5° N and the Tropic of Capricorn 23.5° S. Covers 39.78% of Earth's surface. The South temperate zone, between the Tropic of Capricorn 23.5° S and the Antarctic Circle 66.5° S. Covers 25.99% of Earth's surface. The South frigid zone, from Antarctic Circle 66.5° S and the South Pole 90° S. Covers 4.12% of Earth's surface.